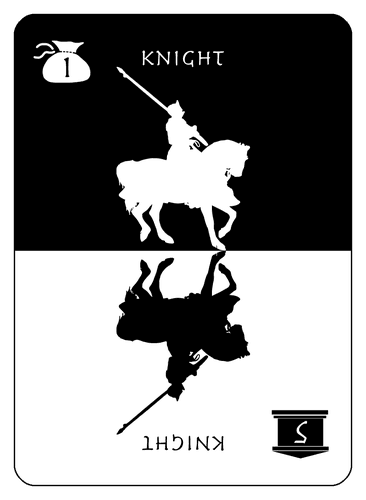 i have played alot cooperative-games like lord of the rings (living card game) or robinson cruseo. the full-coop games feels to me like i can play solo and when more players added then we speak alot - not necessary to play more than solo for me (sorry, only my opinion). so i search good coop-games which have more than that. -a coop game, where all the peoples have the same target (survive xy, kill xy) and you must work together BUT you become victory points and when the game is over all have won but one person is the one with the most vp. -a coop-game where all the peoples work together till one moment (survive the zombies BUT dont eat me - eat him ~but with more coop than mall/city of horror). -where you form pacts with other players to work together vs the game till a moment or something changes. also i mean semi coop-games. did you have please some recommendations for me? i think its a hard one to find. 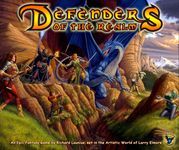 I think you might like Pathfinder Adventure Card Game: Rise of the Runelords – Base Set. It's coop game where everybody has the same goal. It has an RPG feel, and it's easy to learn and play. If you have a consistent game group, you can level up and continue playing the next scenario. The first game which springs to mind is CO₂. You compete, but you are also cooperating to prevent global warming. Perhaps Kingsburg is a better example of what you're after; players all exert their influence in the court the year round, but must also face a common enemy when Winter comes. Both these games are very different; both are semi-cooperative, and both are rather good, IMHO. Castle Panic particularly with the expansion: Castle Panic: The Wizard's Tower. It's cooperative in that you need to protect the castle to win, it's semi-cooperative as the player with the most victory points wins. Can be a tricky balance between what's good for the group but also what's best for you as the player. Legendary is my favorite semi-cooperative game, although I usually just play it full on co-op and see who the individual MVP is at the end with points. The newest set, Legendary: Villains – A Marvel Deck Building Game, is supposed to be much more on the competitive side of things while maintaining some cooperativeness. Another one is Castaways. While it's a fairly easy co-op on its own, playing it semi-cooperatively allows you some room to make sub-optimal moves for your own benefit. It's a little long for what it is, IMO, but I think it's worth checking out if semi-cooperative is what you're looking for. Defenders of the Realm with the "King's Champion Variant"
thanks a lot for the recs! 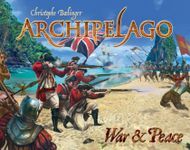 why archipelago? i never heard something like its semi-coop (but i never played it and heard that the game would not so good). Archipelago is a very strange game indeed. While players are competing against each other to win the game, they collectively have to keep the rebellion level at bay, because if not, everyone loses the game, it does not matter who is leading. 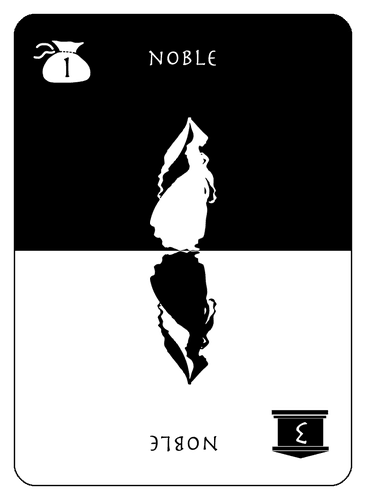 In Archipelago, a player wins based on individual achievement. But everyone can collectively lose if players play too selfishly. For instance, exploring is exciting and a great way to get resources… but it leads to large swathes of indigenous workers who, without something do, might revolt. Meanwhile, making babies is the cheapest and easiest way to get more citizens… but overpopulate and you're looking at revolt. And taxation is by far the cheapest and easiest way to make money… but I think you can figure out where that leads (if you guessed revolt, you're a smart cookie). The best actions in Archipelago upset the equilibrium. More board games need this. The problem with many co-op games is that one or two skilled players dictate the course of the game for everyone. 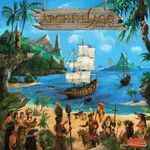 Archipelago avoids this problem by keeping each player distinctly competing towards their own interests and gives them no reason to demand perfect play from others. Conversely, the problem many competitive games have is the run-away leader. Archipelago mitigates this through the cooperative aspect. If one player starts doing too well, there is less incentive for other players to keep the balance. They can play more aggressively (and perhaps catch up) if they feel they'd be better off collectively losing anyway. It's a great dynamic that keeps every game close. We have both Castaways/Naufragos and Castle Panic. I think Castaways does a better job of bringing out the semi-coop feel. In Castle Panic, you can pretty much play it as a pure coop. IMO, the winner part feels pretty pasted on, like they just wanted a way to have someone win. Also, you will want the expansion before too long - it quickly becomes very easy without it. Castaways more frequently forces you into situations that put you at odds with other players, like you get into a fight with another castaway because you're all irritable and grouchy from being stranded on a deserted island for so long. The semi-coop aspect feels more thematic in this game. Archipelago is indeed a suggestion that perfectly fits your criteria. 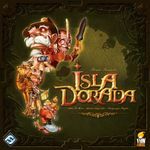 Though I have to say that, from the two times I've played it, it feels quite cut-throat and competitive from the get-go. To me personally it doesn't feel cooperative because we (by that I mean my gaming group) only help each other to avoid being penalized. I know you asked for semi-coops, but it seems like you also want coops that can't be solo'ed. In that case, you should definitely check out Hanabi. Also consider real time games like Space Alert or Space Cadets. You cannot grasp the true form of Giygas' attack! One of my favorites! Generally, you're best games of this are gonna be with people that truly want to play it or already love it and fully understand and appreciate just how unique any given playthrough of this can be. I'd actually recommend looking at A Study in Emerald - it's not really a co-op, but if you're experienced gamers then it may be a good fit. In the game you need to help others whom you think are on your team (whom may or may not be), and ultimately if you don't help your team enough your entire team loses. Only the winning team is eligible to have a winner (and there is only 1 for the game). A strange game indeed that ebbs and flows when you play, but highly recommended if you like Mythos, some area control, and some deckbuilding. Castle Panic! is good, but may be a little light. On the plus side, it's great for if you ever play with kids. You'll really want to pick up the Wizard's Tower expansion to go with it, though. 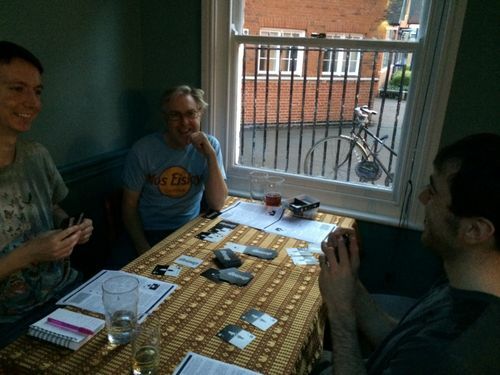 Hidden traitor games like Battlestar Galactica: The Board Game or Shadows over Camelot can be great semi-coops, but they might have too much speaking for your tastes. Cutthroat Caverns requires player to cooperate for a majority of the game to survive, but backstab each other when the time is right to win individually. If I may be so bold, my game Allegiance seems to be a perfect fit for you. All players start out as members of a temple, working together against a thieves' guild. During the course of the game, however, players can convert to the thieves guild. 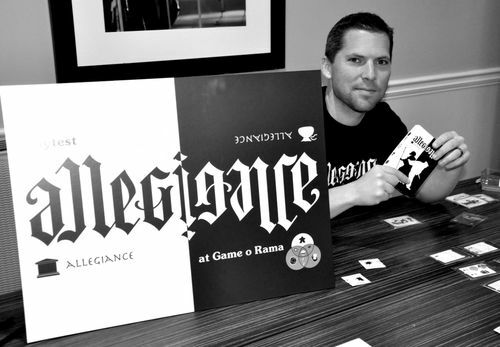 At the end of the game, if the temple wins all players that maintained allegiance to the temple win as a partnership. If the thieves guild wins, only the "best" thief wins. 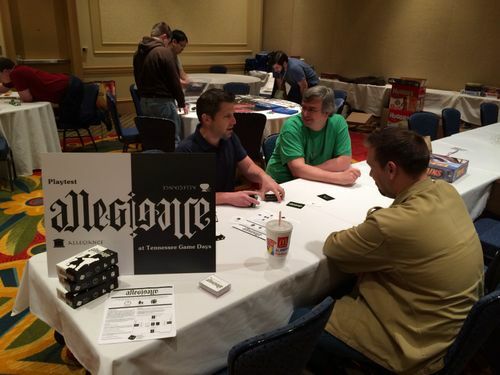 I've been developing Allegiance since November and I just wrapped up play testing. You can download the game as a PnP. I'm planning to publish it very soon. You are a priest of a troubled Temple. A Thieves’ Guild has emerged and is challenging your Temple for influence over the land. You must decide whether to work along with your brethren in the fight against the Thieves Guild or betray your brothers and guide the Thieves’ Guild to prominence. 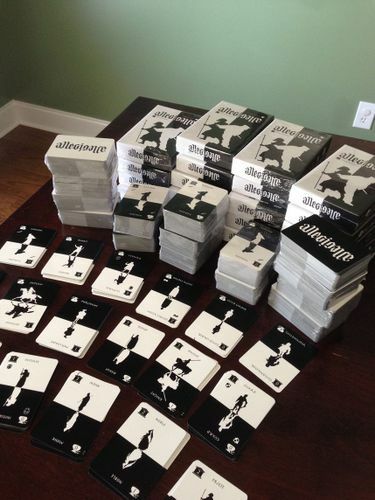 In Allegiance, players use cards to adjust the influence of the Thieves’ Guild and Temple. At the end of the game, the organization with the most influence emerges to prominence. Players begin with an allegiance to the Temple. However, that allegiance can shift during the game as players accrue points that align them with either the Temple or the Thieves’ Guild. All players with allegiance to the Temple win if the Temple has the most influence. One player with allegiance to the Thieves’ Guild wins if the Thieves’ Guild has the most influence. Will the players maintain allegiance with the Temple and work cooperatively to try to achieve victory? Or will one or more of them turn rogue and align with the Thieves’ Guild in a high-risk, high-reward attempt to win it all? 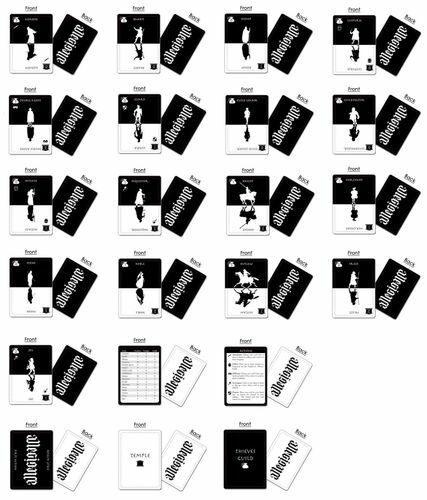 You can download the PnP components from the BGG entry for the game, or get the high resolution files from the game's website. (BGG limits the file sizes that can be uploaded to the files section of game entries). They call me Troll; Gnawer of the Moon, Giant of Gale-blasts, Curse of the Rain-Hall, Companion of the Sibyl, Nightroaming Hellion, Swallower of the Loaf of Heaven. What is a Troll but that? As a group you explore an old house until at some point one person is revealed as the traitor (upon which time you basically reenact various horror movie motifs). The Republic of Rome or Founding Fathers are competitive games where players are forced to work together. They are historical and the first one somewhat complicated. I'll also second suggestions like BSG and Space Alert. i have thinked space alert is full-coop? Yes sorry about that, it is free from the problem of the co-op leader syndrome, and I had just read a thread asking about that. I'm afraid about crisis resolution in this game. Let's say there's crisis and you need 10 fruits. One player have 9, one 5, and one 4. I'm afraid that every player claims that he won't give all of his fruits and game ends. Nobody have any leverage, and maybe I could give all my 5 fruits and guy with 9 gives only one, but he can't be punished for such play.